The picture I have chosen to introduce this article is a three dimensional fractal. Hopefully it can demonstrate how a simple universal truth (in this case, a mathematical construct) can give rise to all the beauty and complexity we perceive as reality. Ichinen Sanzen is the Buddhist theory that describes that reality. Despite having written at length regarding the Ten Worlds, the Ten Factors and Three Realms, it is almost inevitable that my words alone will only have provided the briefest overview of the theoretical components that together form the theory of Ichinen Sanzen – three thousand realms in a single moment of life. There are many discourses that serve to explain Ichinen Sanzen by way of a posthumous analysis of various situations and events. You must have read them – e.g. Peter got out of bed, made breakfast, received a letter through the door that turned out to be his divorce papers – and then follows a detailed description of how each moment of this sequence of events relates to the Ten Worlds, Ten Factors and Three Realms. This kind of thought exercise is all well and good, but in doing so, we are only deriving a self satisfied theoretical understanding of what might have been Peter’s Ichinen Sanzen, without any practical benefit or method of observing or influencing it in real time in our own lives. For example, with spanners, and screwdrivers you might strip down an aeroplane to its constituent parts, but staring at the thousands of bits and pieces for a lifetime will bring you no nearer to being able to fly safely from A to B or to understanding the theory of flight. Just like the Ten Worlds, Ten Factors, and Three Realms, in and of itself Ichinen Sanzen doesn’t provide us with the mechanism for applying mindfulness in daily life. Now let’s begin exploring how Nichiren Daishonin incorporated it into our daily practice. 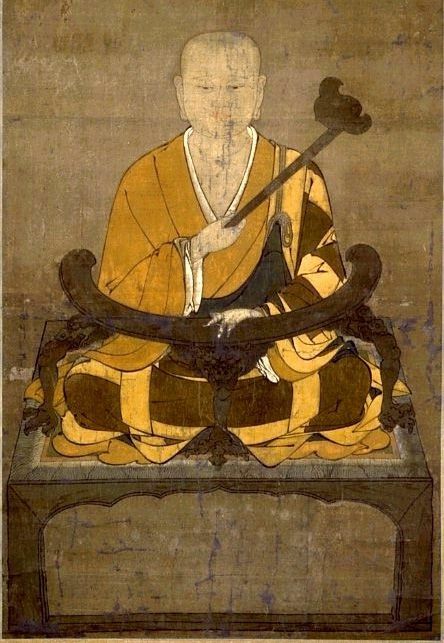 The theory of Ichinen Sanzen arguably first came into being in China when Chih-i (538-597 CE), the great Buddhist philosopher of the Madhyamaka, set forth on systematising the Buddhist teachings from India. Despite being the fourth patriarch of the T’ien-t’ai school of Buddhism, Chih-i is generally accepted as the de-facto founder of that school. He is often referred to simply as the great teacher T’ien-t’ai. In his work, Chih-i had to overcome the negative and nihilistic dialects that earlier Indian teachers such as Nagarjuna used, and instead prepared his material using more positive language that was preferred by the Chinese. Ichinen Sanzen effectively arose from the concepts of dependant origination (cause and effect), emptiness (nature) and impermanence (appearance). Chih-i interpreted Nagarjuna’s teachings on the nature of emptiness from a different perspective. Chih-i taught that emptiness (nature) and impermanence (appearance) are merely two aspects of the ultimate truth – the middle way. Indeed, Chih-i taught there is no other reality than the middle way (the world we experience). So, while both Chih-i and Nagarjuna viewed the ultimate truth of all phenomenon as enlightenment, it was Chih-i who explained this in terms of all phenomena being in harmony with one another, and perfectly integrated – at least in language that we would understand more readily. This harmony and integration gives rise to the concept of mutual possession, which is essentially an expansion of dependent origination. Mutual possession, as we have already covered gives rise to the unavoidable logical conclusion that Buddha is all phenomena, including you and I – that emptiness itself is Buddhahood. A mind by nature contains ten worlds of living beings. Since these ten worlds contain one another, there exist 100 worlds in one mind. Furthermore, each of these 100 worlds consists of “three realms,” that is to say, living beings, the land on which they live, and the five aggregates of living beings. They also possesses “ten factors”. Thus, 30 modes of existence are in one world and 3,000 modes of existence are in 100 worlds. In short, 3,000 modes of existence are contained in the mind at any given moment. When there is mind, even for a momentary flash, 3,000 modes of existence are in it… Thus a mind is unfathomable. And there is the crux of the issue – the mind is unfathomable! So, what’s the point of Ichinen Sanzen if all it really concludes is that the mind is unfathomable? Although it is often written that the number of three thousand realms is specific and not arbitrary, this is true only insofar that it comprises the theories of its component parts (which we have already covered). For example, if one were to treat the first of the three realms (the five components) verbosely, then we might truly be looking at several thousand realms. What if one formulated other divisions within the realm of society or environment, for example, or indeed if the Avatamsaka Sutra (Flower Garland) had depicted eighteen Dharma Realms instead of ten, then future theories would quite rightly have derived an even higher number of realms in a single life moment. The point I’m trying to make is that the specific number of three thousand is not pivotal in the practical application of Ichinen Sanzen – it has only theoretical relevance in serving to demonstrate that our unenlightened seventh consciousness (our waking self) has no hope of grasping, from moment to moment, the innermost workings of our mind. 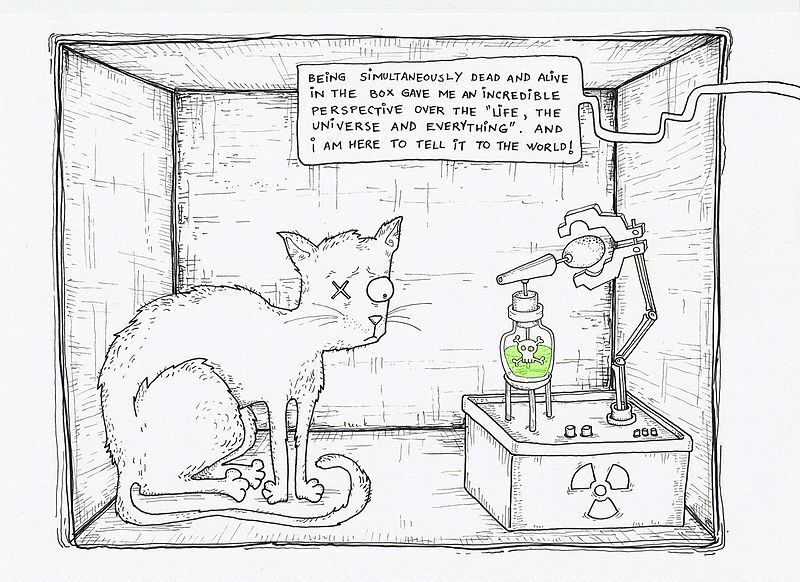 Austrian physicist Erwin Schrödinger in 1935 devised a thought experiment in which a cat was placed into a box along with aparatus designed to release poisonous gas upon the decay of a single atom of a radioactive element. Of course, the experiment was only theoretical, but it demonstrated perfectly the inability of the observer to determine the state of what is essentially a dynamic quantum system. The difference between the cat’s experience and the external observer’s experience (from a relational interpretation of the system) parallels the difference between how our Buddhahood or ninth consciousness, and our ego, or seventh consciousness both perceive our phenomenal being. To the observer of the box (or in other words, to the conscious ego attempting to observe the mind) the cat’s state is indeterminate – and just as the cat is simultaneously both dead and alive, so our mind simultaneously comprises three thousand realms. It is this superposition of states that we simply cannot observe until the box is opened. 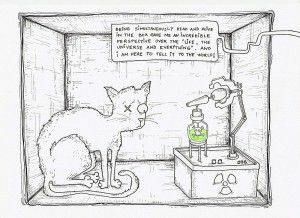 Of course, the cat in the box (representing our Buddhahood) knows full well whether it is alive or dead. This extends my metaphor whereby to grasp the true state of our life at any moment is only possible from our enlightened state, or Buddhahood. When there is mind, even for a momentary flash, 3,000 modes of existence are in it… Thus a mind is unfathomable. The reason for this slight detour is really to demonstrate both the profundity of Ichinen Sanzen as a theory, but also how it is useless in any practical sense without a further framework of daily practice (whatever that is) or meditation in order to connect our lives with it at a deeper level. The process of connecting our seventh consciousness to our Buddhastate is the act of observing the mind (the practice of mindfulness). Prior to Nichiren Daishonin, this was only to be achieved by following strict meditative practices such as those outlined in T’ien-t’ai’s Great Concentration and Insight. Of course, the Buddha achieved actual observation of the mind when he attained enlightenment in the inconceivable past. In the Juryo (Life Span) 16th Chapter of the Essential Teaching of the Lotus Sutra, Shakyamuni Buddha expounded the Three Mystic Principles, which were True Cause (the Buddha’s practice that lead him to enlightenment), True Effect (the Buddha’s enlightenment), and True Land (the place where the Buddha had been expounding his teachings since his original attainment of enlightenment.). We learn from this that all phenomena express Ichinen sanzen and can therefore possess Buddhahood. This is actual Ichinen Sanzen from the standpoint of Shakyamuni’s Buddhism, but is still inaccessible to the people in the Latter Day, and therefore from the standpoint of Nichiren Daishonin’s Buddhism remains, prima facie, theoretical. Nichiren believed that these methods for obtaining enlightenment did not fit the time, nor the capacity of the people, and he strove to develop a path more accessible to the people of the Latter Day of the Law. The principle of Ichinen sanzen begins with an understanding of the mutual possession of the Ten Worlds or states of existence. To the people of Japan at the time, these concepts were incredibly difficult to believe and difficult to understand. Buddha’s were directly worshipped by many, and were believed to exist in various Buddha lands, rather like the Christian God, sat in heaven. Thus the Lotus Sutra became marginalised as many schools believed people could not attain enlightenment or benefit from it. The Opening of the Eyes is an important Gosho in that it also establishes Nichiren, based on the persecution he suffered as the foremost votary of the Lotus Sutra, as the Buddha of the Latter Day of the Law; or in other terms, the object of devotion in terms of the person. Nichiren later went on to write The Object of Devotion for Observing the Mind. In it, he expresses the object of devotion for observing the mind in terms of the Law as none other than the five characters of Myoho Renge Kyo. Shakyamuni’s practices and the virtues he consequently attained are all contained within the five characters of Myoho-renge-kyo. If we believe in these five characters, we will naturally be granted the same benefits as he was. If you can shield and guard those who accept and uphold the mere name of the Lotus Sutra, your merit will be immeasurable. At the eight-year assembly on Eagle Peak, he [Maudgalyayana] embraced the Lotus Sutra and chanted Nam-myoho-renge-kyo, and became Tamalapattra Sandalwood Fragrance Buddha. Nichiren repeatedly uses simile and metaphor to explain why the Daimoku of the Lotus Sutra is very powerful, and how embracing the Daimoku brings benefit equal to that of embracing and reciting the entire Sutra. These are Nichiren Daishonin’s (as the Buddha of the Latter Day) assertions and deductions, and generally do not verbosely appear in the Lotus Sutra itself. So, by chanting the Daimoku of the Lotus Sutra, we bring forth within our lives the wisdom of the Buddha. This practice elevates our default life condition bit by bit; it changes our Karma from one where the endless cycle of creating the causes and experiencing the effects of our negative thinking can be transformed into the indestructible freedom of wisdom, compassion and happiness. I, Nichiren, have inscribed my life in sumi ink, so believe in the Gohonzon with your whole heart. The Buddha’s will is the Lotus Sutra, but the soul of Nichiren is nothing other than Nam-myoho-renge-kyo. Down the centre Nam Myoho Renge Kyo represents the oneness of the Person and the Law. This illuminates to the left and right the various forces and influences in life, both positive and negative, that all existence possesses; thus depicting the mutual possession of all Dharma realms within the state of Buddhahood. The Gohonzon is the Mandala Nichiren inscribed for all humanity. The Gohonzon is the clear mirror, in which we can view the reality of our own entity. The Gohonzon’s properties to help us view our Buddhahood are no different from a mirror’s ability to show us our reflection. It has no intrinsic power of its own beyond this facility. This isn’t to diminish in any way its beauty or importance to our practice. It is this very instruction from Nichiren which seems to have been forgotten over time by the priesthood of Nichiren Shoshu. The Gohonzon is NOT an occult talisman, lucky charm or other juju. It is NOT a rabbit’s foot! The Dai Gohonzon holds no more power to reflect our Buddhahood than the copy (and it is a copy, let’s not forget that) in my Butsudan. In terms of the Threefold Truth, the Gohonzon’s appearance is the beautiful paper scroll printed with Nichiren’s inscriptions – the nature of the Gohonzon is to connect us with our Buddhahood and our Ichinen Sanzen when we chant before it with firm faith in the power of Nam Myoho Renge Kyo. The information within is very insightful. It validates other’s thoughts on the matter therein. Peace and Love to all. Words such as these I believe makes Lord Buddha the Gohonzon and The Great Boddhisattva Nichiren very happy. Thank you, Nena. Have a lovely day! Leave a Reply to nena Click here to cancel reply.